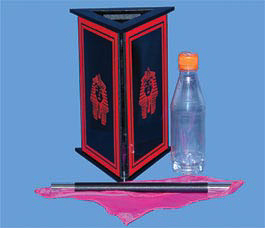 The magician shows a bottle with a silk inside it to the audience.The silk is removed from the bottle, the bottle is recapped and placed inside a beautiful three sided frame. Then three decorated boards are placed around the frame isolating the empty bottle. The magician then vanishes the silk into thin air. When the bottle is revealed the silk is back inside the capped bottle! Very easy to perform, beatiful props and an ingenious method you will love!